A couple of weeks back I went to a competitive blind wine tasting organised jointly by Naked Wines and Findwine, another relative newcomer to the online wine retailing scene, and attended by a handful of bloggers as well as staff and customers of both companies. Fifteen pairs of wines were judged head-to-head, with Naked winning the majority of the battles. This was hardly a surprise. I had a good chat with their founder, Rowan Gormley, who said you could normally tell the difference between one of their wines and a Findwine offering (or pretty much any other wine retailer’s), because theirs were chosen by customers and their rivals’ were chosen by wine experts. So theirs might lack a little complexity, they might not be enormously challenging or thought-provoking, but they are immediately pleasurable. As Jordan’s success proves, the British public are frequently happy to prioritise the superficially appealing over greater depth and profundity and as it is with large-breasted celebrities, so it is with wine. The fact that they win competitions like this doesn’t mean their selection of wines is necessarily better overall than Findwines’, or anyone else’s (there’ll be more about some crackers from Findwines next week, in fact). It is just different. How different they are only became apparent once I talked to a couple of their customers, selected from their keenest members – archangels, in NW terminology. The archangels are NW’s Robert Parkers and IWSCs and Decanters, all rolled into one. Their opinion rules. A selection of them get sent, for free, pretty much every new wine the company are considering adding to their list; anything that doesn’t wine go down well gets dumped. This means that even new wines are launched with plenty of positive customer feedback, ready to encourage others to partake. Online, customers discuss the wines with each other, and often with the winemakers too. So if you talk to an archangel, they’ll refer to their favourite wines not by what it says on the label, but by the winemaker’s first name. In this way NW are, I think, enthusing people about wine in a different, more relevant, less stuffy and rather original way. And it’s enthusing them quite a lot: their most expensive offering is a wallet-frightening £32.99. All of which doesn’t make NW perfect, far from it, but it does make them quite exciting. While I’m on the subject of NW, the other night I tried a wine called Facundo, made by the happy couple pictured on their website at the top of this post. The contents of the bottle are pretty special, given that they are not merely a fairly pleasing alcoholic beverage, but a quite detailed expression of the pair’s mutual adoration. 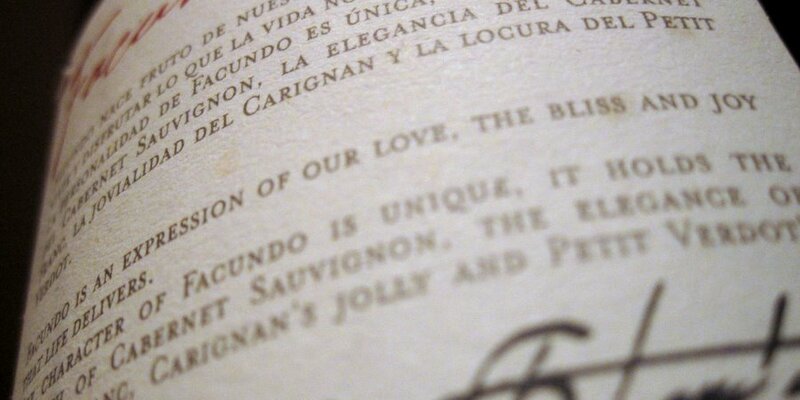 “Facundo is an expression of our love, the bliss and joy that life delivers,” reads the back label. “The character of Facundo is unique. It holds the strength of cabernet sauvignon, the elegance of cabernet franc, carignan’s jolly and petit verdot’s folly.” Eh? What happened to saying it with flowers? I guess there’s something apt about celebrating the union of two people by blending grapes, though their choice of not two but four different varietals suggests theirs might be a more open marriage than some. Good wine, though. A bit straight-laced upon opening, but much better for a bit of time in glass/decanter. Once it had pulled off its tie, unbuttoned its shirt and is slouched a little bit on the sofa, Facundo proved a genial companion for an evening that certainly ended with me slouched on the sofa. Good choice, archangels. This entry was posted in Uncategorized and tagged Facundo, Naked Wines, red blends, wine retailing. Bookmark the permalink. The taste-off was a really interesting and fun evening. Good point you make about the wine choosing process. My overriding sense from the night was that the majority of people weren’t too bothered about tasting notes or posh wine speak, they were there to have a good time with good wine.